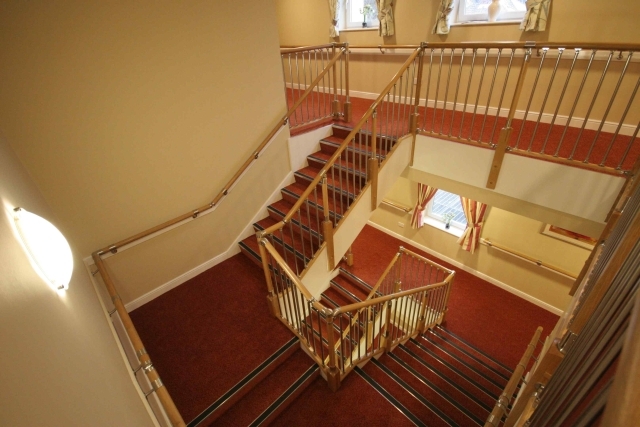 Rapid installation balustrade and handrail system for straight stair flights in light commercial applications. It combines prefinished oak posts and rails with adjustable metal joints and balusters in a brushed nickel finish. Glass panels are also available. Requires no site adjustment other than cutting wood components to length. Cut edges are concealed by metal fittings. Withstands loading of 0.74 kN/m (to BS 6399) when installed to manufacturer instructions. Metal balusters and glass panels delivered cut to size. Base rails, handrails, newel posts and newel bases: White oak, clear polyurethane finish. Connectors: Zinc alloy, brushed nickel finish. When used with a cut string, the base rail is suspended and requires SBCB connectors to newels. Balusters: Stainless steel, brushed nickel finish. Glass panels: 8 mm thick toughened safety glass. 90 x 90 x 400 mm. 55 x 27 x 2400 mm. 55 x 27 x 3600 mm. 55 x 27 x 4200 mm. 54 x 2400 mm (diameter x l). 54 x 3600 mm (diameter x l). 54 x 4200 mm (diameter x l). Glass panels for landings; includes brackets. Glass panels for return landing, includes brackets. Glass panels for staircases, includes brackets. Glass panels for horizontal to rake transition, includes brackets. Connects handrail to a post on landing, adjustable. Connects bottom newel post to stair handrail. Baseplate for newel post, screws to tread. Transition connector for handrail, accommodates angular change. Top cap for newel post. Connects stair handrail to mid post, where the staircase turns mid-flight. Connects landing handrail to intermediate newel post. Connects stair handrail to intermediate newel post. Connects landing handrail to newel post. Connects newel base to separate newel post. Connects adjacent newel posts on half landing. Connects raking suspended base rail to newel post. Corner bracket for suspended landing base rail. Connects handrail to square newel post. Top cap for square newel post. Connects stair handrail to top newel post. Corner bracket for landing handrail. Connects landing handrail to wall. Wall mounted return bracket, for end of run.